Repeat something enough and people will swear it is truth. Continue to repeat it and they will believe it happened to them. 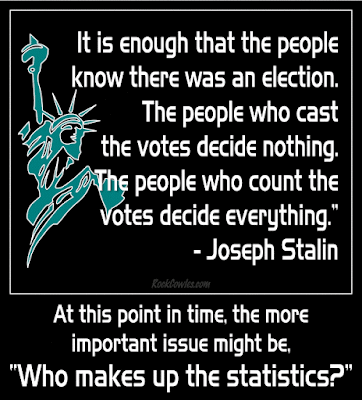 Good old Joe Stalin said, "It is enough that the people know there was an election. 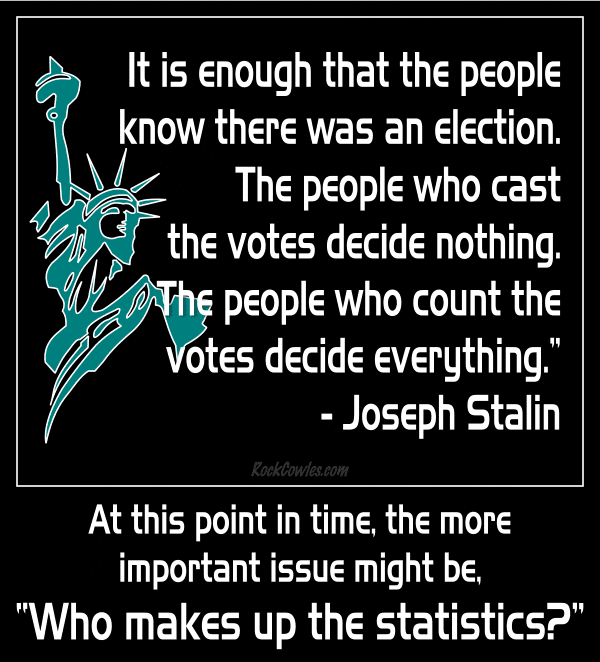 The people who cast the votes decide nothing. The people who count the votes decide everything." Today we are played by the Main Stream Media, Political advocates, advertising agencies, race baiters, religious zealots, and special interest groups of every stripe, shape, size, and color. We are subjected to so false knowledge and statistics at an alarming rate and constantly battered with unvalidated information and opinions masquerading as facts. From coast to coast and around the world hatred is being fueled by lies and propaganda under that guise of statistics. Claim an official source and people's brains shut down. Most of these are blatantly false, but very few of us bother to do fact checks before reacting to them and sharing them, especially under the false anonymity of social media. It is an epidemic that is tearing America apart at the racial, religious, and political seams. Call out anyone who arrogantly spouts out questionable statistics. Ask for the source and then verify it yourself through multiple venues. Go beyond the Main Stream Media and your favorite blog or podcast. Think for yourself while you are still allowed too! Edward Bulwer-Lytton knew what he was talking about when he said that the pen was mightier than the sword. Get people riled up with propaganda and they will raise arms. 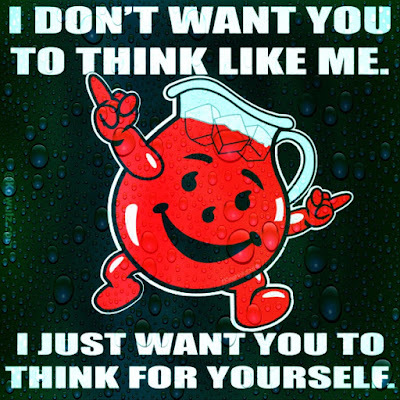 The true believers kill police officers and civilians in America, France, are firm convinced that they are acting out of righteousness rather than hatred because they drank the Kool-aid (Google it if you must). Refrain from commenting on or sharing unwatched videos, articles, or posts because you like the title or it might support your beliefs. Plato said that the unexamined life is not worth living. Look inward and challenge and investigate you believe. Break free of cognitive dissonance and your biased upbringing and find out what really matters to you before offering any opinion to others. Just because you have an opinion doesn't mean it's a good one. We must recreate ourselves as individuals before we can fix cultures, societies, nations, or the world. No more Kool-Aid. Gordon A. Eadie said that if you don't stand for something then you will fall for anything. The tough part is being clear on that something. Conviction alone doesn't equal justice. Probity is defined as "integrity and uprighteousness". Embrace it. Be right before being heard. Let the healing begin with me. 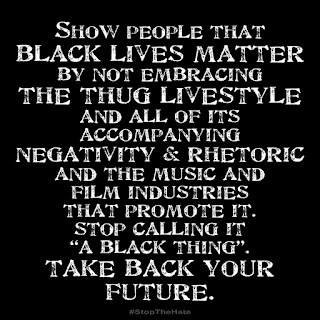 I'm bothered greatly by Black Lives Matter. Once you isolate a group or class from everyone else it can no longer be about equality, it's about exception. White Pride, Black Pride, Gay Pride. What's to be proud of? None of us did anything to be born White, Black, Gay, intelligent, athletic, artistic, etc. It's too often about having one's way all of the time and not having any repercussions. With rare exceptions, BLM's martyrs were all men with violent criminal histories who were faced with the choice of following the law and cooperating with police or not. Choosing to believe they were the exception, not their race, lead to their demise. Life exposes all of us to the differences between right and wrong. It's very simple; Don't hurt people and don't take their stuff. Yes, there is inequality between some Blacks and some Whites, but the same can be said among Whites and other Whites and Blacks and other Blacks. 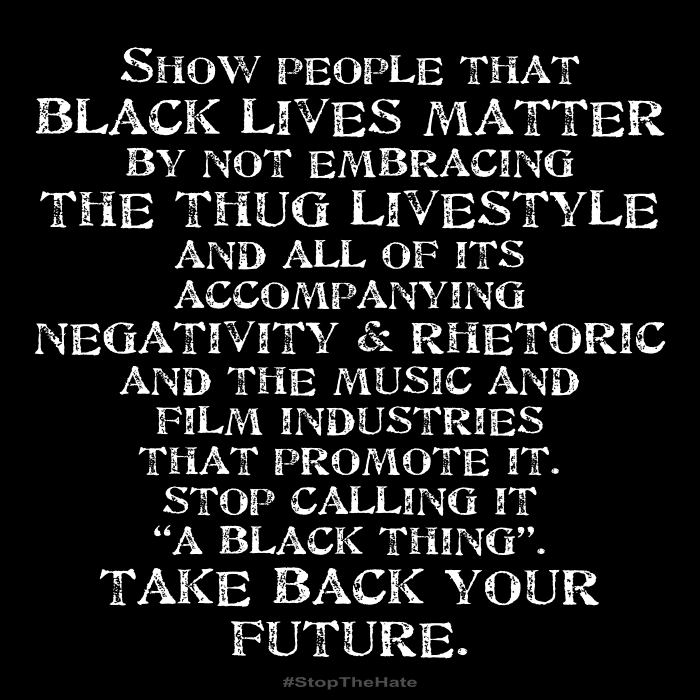 That is Life, not which lives matter. As a rebellious young man I chose nonconformity and noncompliance as a way to express myself and to stand out as being unique (like all of the other nonconformists). These were choices like tattoos, piercings, partying, and clothing statements. I paid for them and still pay for some. My choices, my doing. Heinlein said, “I am free, no matter what rules surround me. If I find them tolerable, I tolerate them; if I find them too obnoxious, I break them. I am free because I know that I alone am morally responsible for everything I do.” It actually goes much deeper than that, I am responsible in every way for every choice I make even within a world in flux. Mankind wants more than companionship or friendship, It wants fellowship; to belong to something greater than itself. Sometimes this manifests itself as a cause, but usually, it is seen as membership. Economic class, gender, age, race, religion, lack of religion, profession, politics, education, sexuality, height, weight, favorite sports franchise, IQ, school, neighborhood, special interests, hobbies, etc. In the process, we forget that first and foremost we were all members of The Human Race. We then tend to seek out differences rather than similarities and isolate ourselves to the extent that we often don't feel like we don't belong anywhere. We all have more in common than we do that separates us. 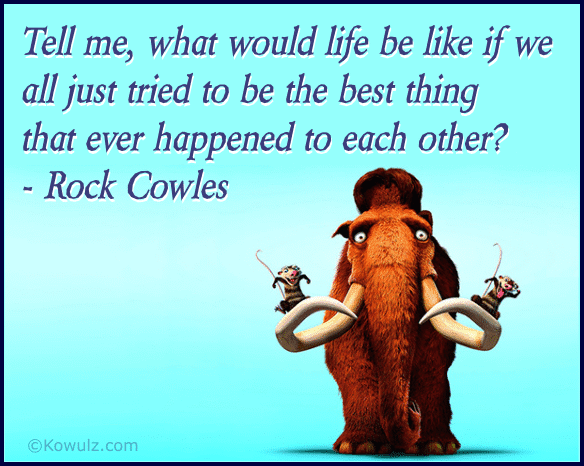 What would happen if instead of looking for what sets us apart, we sought out what we have in common? Tell me, what would life be like if we all just tried to be the best thing that ever happened to each other? I just watched President Obama's speech at the Interfaith (?) 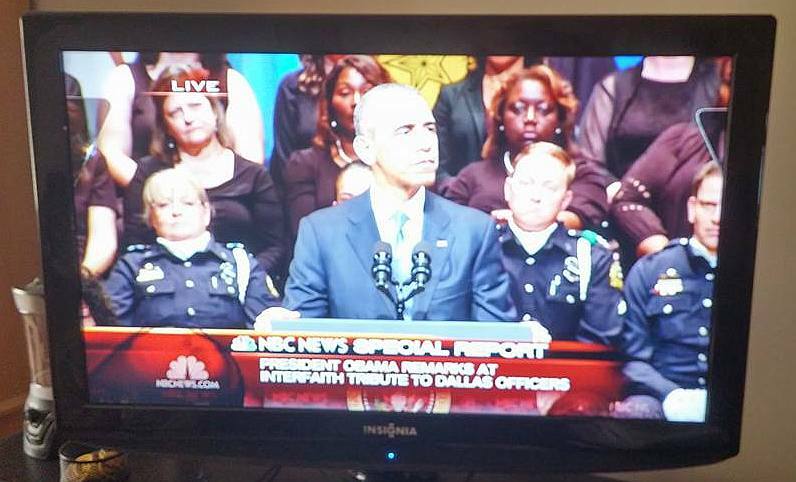 Memorial Service in Dallas. He is an exceptional speaker. Very slick. I thought he did a great job and for the most part said all of the right things. He did say that "we" are flooding poor communities with thousands of guns and making it easier for children to get their hands on Glocks than computers or books. I took issue with that. The guns going into those communities are there because of crime. Because people are afraid and because people steal them. The War on Drugs is a HUGE part of that. It turns communities, especially poor ones, into war zones. We spend more money fighting it than we do on education! If we repealed drug prohibition and used the money to focus on treatment and education then those communities would have a great chance of bettering themselves. Want to make a difference and leave a lasting positive legacy, President Obama? Quit harping about gun control that doesn't work and can't work, and repeal drug prohibition. One doesn't work, the other one does. 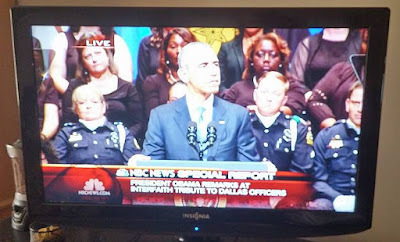 I wonder how much trouble the two police officers who were sitting behind BHO during his speech and falling asleep are going to be in. 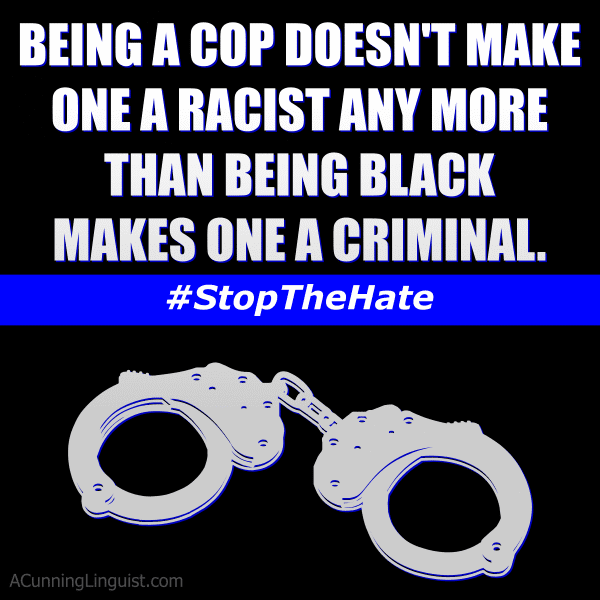 Racism and distrust of law enforcement are epidemic in America today. The Main Stream Media (MSM) has us all getting in the habit of seeing generalizations instead of individuals. We are all becoming experts at "racial profiling" whether dealing with Black or Blue people. It's a crying shame. Innocent until proven guilty and beyond a reasonable doubt are hardly ever heard. They no longer report the news so much as create it. I was pulled over over thirty times in eleven months after I got out of the Navy because I looked like an outlaw biker and drove an old beater ex-police car. I was given one written warning, no tickets, and illegally searched without my consent or probable cause numerous times. I wanted to prove to myself that you could be an honest, decent cop so I started occasionally filling out applications for police officer jobs. Fast forward ten years and I've been out of the police academy three months and pull over an SUV that just blew through a stop sign without even slowing down. The driver gets out of the vehicle and it's a black man that I enjoyed working with for two years at my previous job and considered a friend. We were both hard competent workers who knew how to get the job done and have fun doing it. He was so frightened at being pulled over that he wet his pants standing on the side of the road. I told him to go home and change. It had a profound effect on me. I was aware of the racism in that small southern town but have always been pretty color blind. I crossed the race line and the blue line several times and went through three departments in five years because I refused to look the other way. Cops like me are liabilities. We lose lawsuits for the departments/governments we work for when we tell the truth, the whole truth, and nothing but the truth. I worked with a lot of good cops, but most "crusaders" like myself don't last long in most departments. 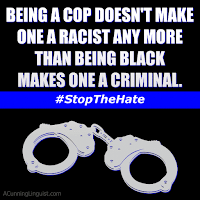 Being a cop doesn't make one racist any more than being Black makes one a criminal. I saved many lives as a police officer, getting people out of bad situations, offering first aid, running into burning buildings to get people out (while wearing polyester! ), intervening when other police officers overreacted and escalated bad situations, and several times by not pulling the trigger when I would have been completely justified morally and legally, but kept my head and my cool under dire circumstances. Many of those people were black. Despite that and my reputation for fairness, guilty people loved playing the race card when they didn't like being caught. Many were taught at a young age that cops are racist and to accuse them of it on a frequent, heartbreaking basis. The MSM sensationalizes it every time a person of color is killed by the police but ignore the facts and the constant black on black crime in liberal cesspools like Chicago, DC, and Baltimore. It's misdirection, very biased, poor reporting, and very inflammatory. They should be held liable for inciting riots. Just like the first amendment doesn't protect someone who shouts FIRE in a crowded theater it should protect freedom of the press when it spreads hate by blowing things out of proportion before all of the facts are in. I don't care what color, creed, religion, nationality, or gender preference you are or what you do for a living, but please stop the hate. Think for yourself even if it leaves you standing by yourself.